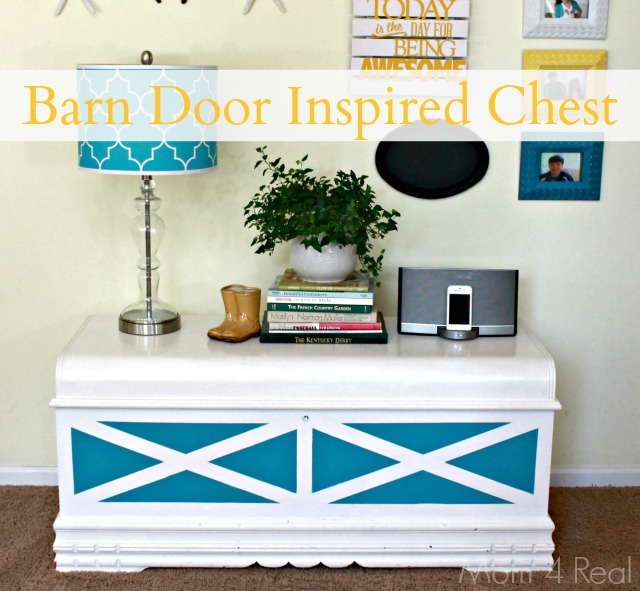 I have been wanting something with a barn door look for so long, so finally painted this barn door inspired chest! I’ve been working on sprucing up my living room a bit this Summer. I wanted to insert a little more color into my decor. I have a crazy love for aqua, and have recently been bitten by the the yellow bug as well, so these are the colors I decided to use in my gallery wall. 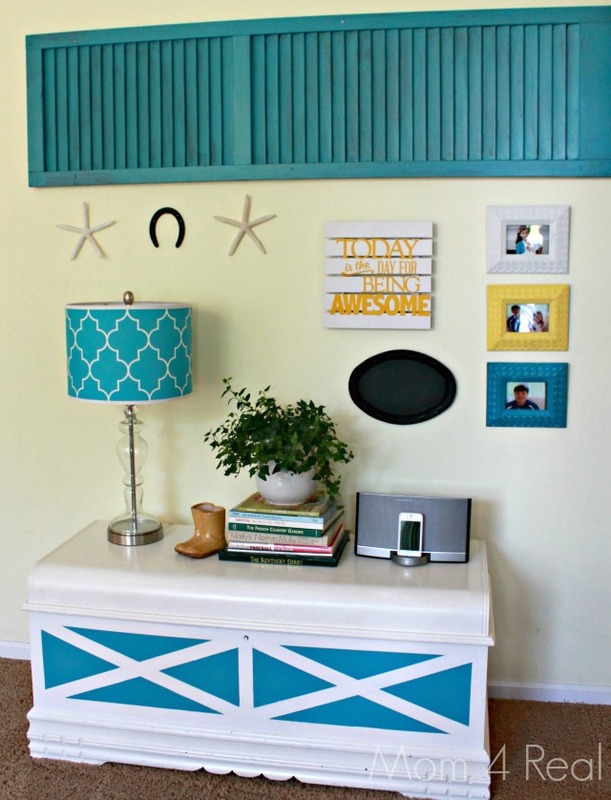 There was one problem though…as much as I was loving my colorful gallery wall, I did not love the chest below it. So, I decided to spruce it up a bit! Some of you may think it’s pretty as is, but I just didn’t love it. I wanted something with a little more color. I wish you could see the picture of this chest before I painted it white years ago. It was horribly scratched and dark brown. For years, we kindly referred to it as the coffin. I know that sounds morbid, but it was truly awful. The inside is amazing, and the perfect place to store our family scrapbooks and keepsakes, but it can be cute too, right? 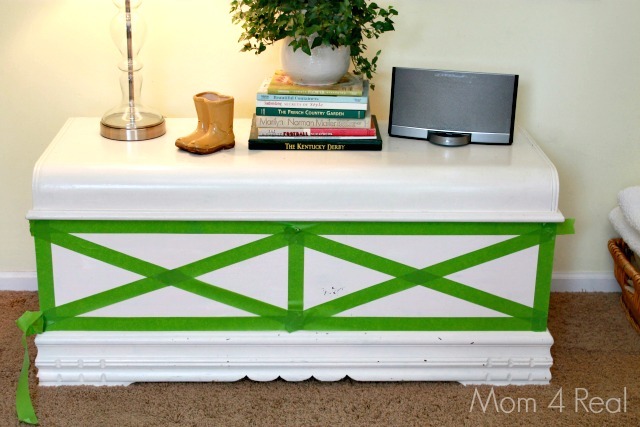 I thought about stenciling it, but decided to go with a barn door look instead, I am a Kentucky girl after all! I simply taped around the tops and sides using Frog Tape, then taped an X on each side, making sure they were centered. Next, I painted over the tape. I painted two coats. I love the way it turned out! Just the right amount of color for me. And, it ties my little gallery wall together! 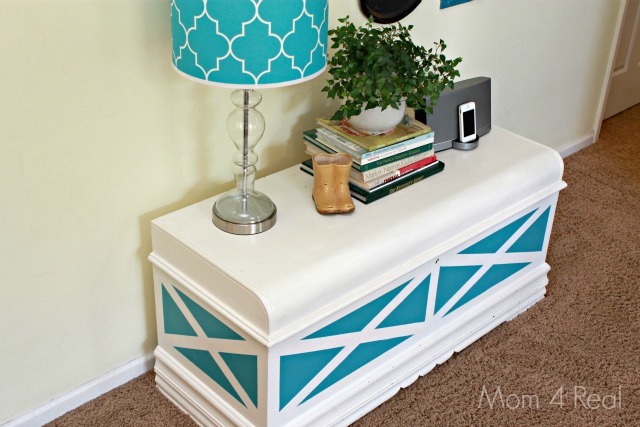 I just love taking something old and giving it a new look! Sharing at Savvy Southern Style, Homestories A to Z, and Beneath My Heart! « Monday Funday! Come Share Your Awesomeness! I think it’s perfect! Just the right amount of color and now the whole wall has a cohesive look. I love it! Pure brilliance. I love it! I love this – such a cute idea. And the whole vignette is so summery and pretty – my favourite colours!! Love the pop of color and the barn doors too! This is so cute! You did a great job and love the colors!. I absolutely LOVE this chest. When I looked at the first picture, I thought you had used wood to create the barn door look. Grat job with the tape! You’ve inspired me to tackle something like this. 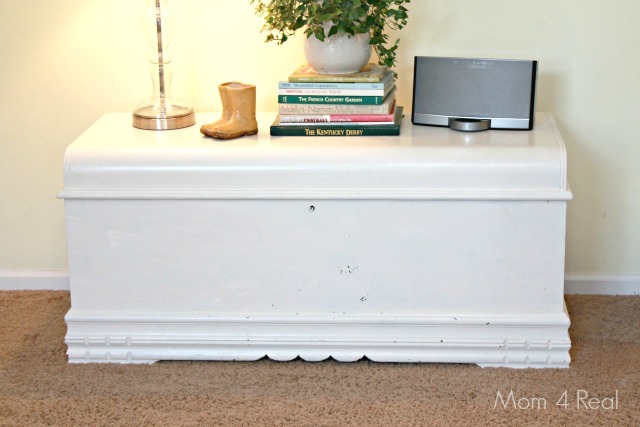 I have this cute little coffee table, I’m thinking maybe taping and painting a chevron pattern on top of it….. Stopping by today from Dorothy Sue and Millie B’s too…. Thanks for posting this cute piece! I’ve recently started buying wooden pieces to paint and sell. Does the frog tape come off easily? How long can it stay on the piece after it’s been painted? Can it be left on too long? 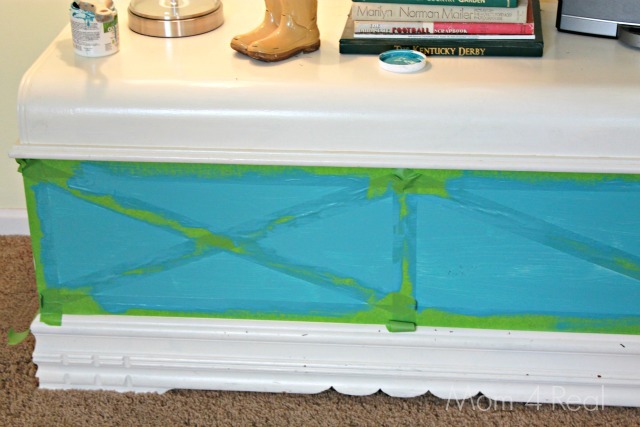 I had green frog tape on a painted piece for well over a month. I learned to hold the end I was pulling up close against the piece, and pull straight downward, rather than pulling outward (with 90 degree angle). Learning lesson: it will come off nicely after quite a long time, if you pull it off correctly- and you could lose some paint if you don’t pull it away correctly. I was using Mythic paint, so don’t know how it will work with other types. There is a blog piece w/ photos someplace on the web. I found it after i learned my lesson the hard way. Still not done with that armoire, so will have to put tape on again…..such is life….it keeps you too busy sometimes….. This chest is a beauty. Nicely painted and quite distinctive and refreshing. We’ve got to get together soon!! Fabulous!! You are a genius!